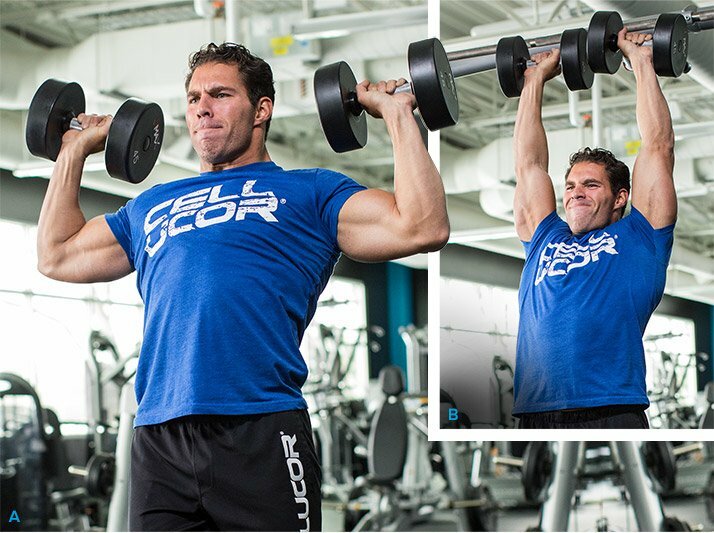 Hang cleans, epic eccentrics, and Tabata-style reps make Craig Capurso's shoulder blast one you won't forget. Strap in, and prepare for a hard hour! 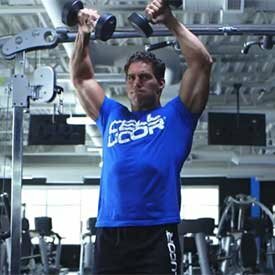 Think you're up for training shoulders with Craig Capurso? Don't expect it to be the same old press-then-isolated-delt-raises routine. 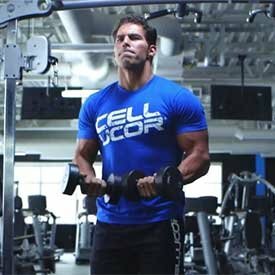 This Cellucor-sponsored IFBB physique pro and longtime Bodybuilding.com spokesmodel has turned his training on its head in recent years, taking a big step away from the classic bodybuilding approach. And guess what? He doesn't regret it for a moment. 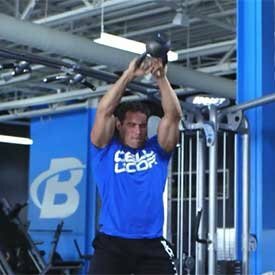 Capurso says his Ultimate Shoulder Workout will improve your power, strength, muscle size, and muscle endurance—all in a single 60-minute workout. "You hit it hard, then you're out. But just like with my Ultimate Back workout, this is going to be one very challenging hour." 5 sets of 5 reps, rest 3 min. 4 sets of 10 reps, 8-sec. negative, rest 2 min. 3 sets of 15 reps, rest 1 min. 4 min. (8 intervals) of 20 sec. work, 10 sec. rest, using a weight you can comfortably raise for at least 20 reps.
Fully-Loaded Formula in Single Scoop Dose! Go Now! Ready to do a few joint circles to warm up? Not exactly what Capurso has in mind for you today. How about a 4-minute round of CrossFit-style kettlebell swings instead? It'll get your blood circulating, pump up your heart rate, loosen up your joints—and make your muscles nice and pliable for the killer workout to come. 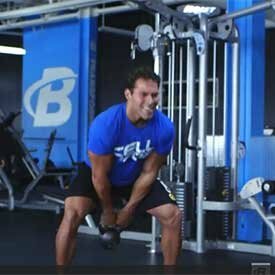 Do these kettlebell swings using both arms simultaneously. Select a load you can do for about 20 reps, then do the swings Tabata-style: alternate 20-second work segments with 10-second rest intervals until you finish the 4 minutes. Use a smooth and deliberate motion to help elongate the range of motion around joints, not to reach muscle fatigue. Don't be a hero with weight selection, either. This is a warm-up, not a finisher! Much like with his back day, Capurso puts the most challenging movement, the hang clean, right up front when your energy levels are highest and you can really load on the plates. You may associate hang cleans with Olympic lifters or football players, but Capurso loves them for building "those bulging shoulders and traps." He also likes them because they aren't as difficult to learn as some Olympic-lifting movements. He advises starting light. The third set is where things get serious. But because of their complex and explosive nature, you should definitely be proficient at hang-clean form before you load them heavily as part of a rep scheme like 5 sets of 5 reps.
Once you're comfortable with hang cleans, do the first two sets well short of muscle failure, with the final three sets coming very close to failure. The low-rep target helps you build strength and power, but as with any movement, if you start to lose form, end the set. Now things really get fun. 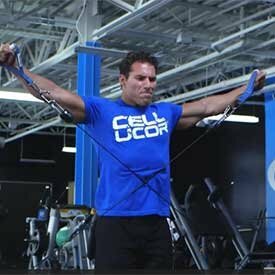 He selects the single-joint cable lateral raise, but then does the movement bilaterally, standing midway between the cable stacks. Oh, and his version includes an ultra-challenging 8-second negative. 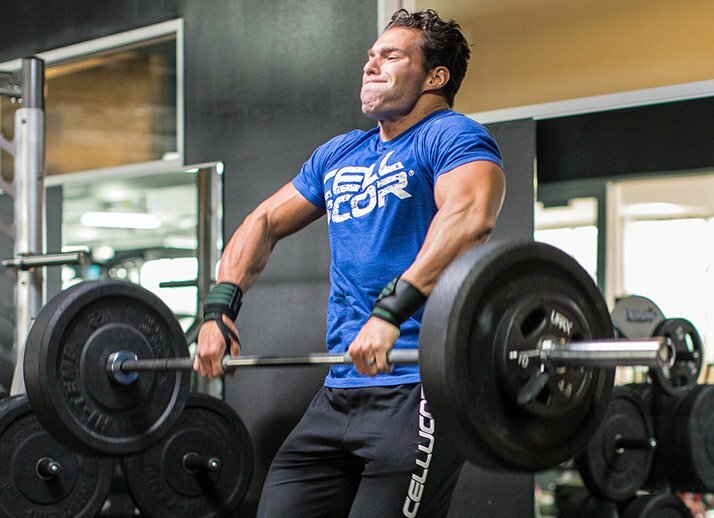 Research suggests you can produce 20-60 percent more force on the negative rep, so that's what Capurso focuses on. He uses the increased time under tension during the negative portion to really work the middle delts—and does it for 10 reps. Adjust your working weight so that you reach muscle failure by the third set. These will be tough. Finally, Capurso adds a dedicated multijoint shoulder movement with the overhead press, which he does standing for a higher-rep target (15). The way he changes the relative intensity (from 5 reps to 10 to 15 in the first three exercises) allows you to stimulate your shoulders in a way that deepens the muscle pump and starts to focus on building muscle endurance. When using the standing version, Capurso suggests you go a bit heavier than with the seated shoulder press. By the third set, you should be struggling to finish. Back to the middle-delts, but with another twist. 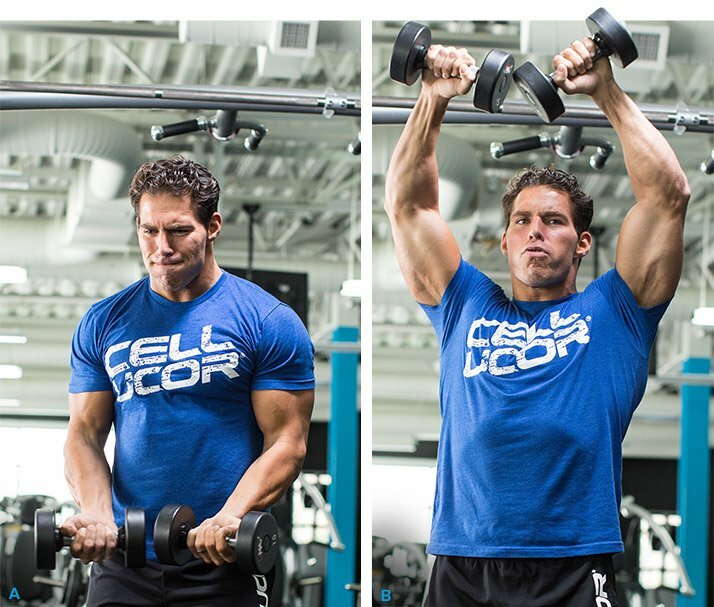 Instead of taking the lateral raises to shoulder height, Capurso takes them all the way overhead. 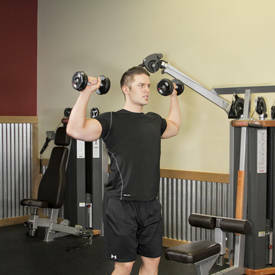 By extending the range of motion, he works the middle delts more fully than when he stops at shoulder height. He also modifies the motion to make it more C-shaped than the arms-extended motion. 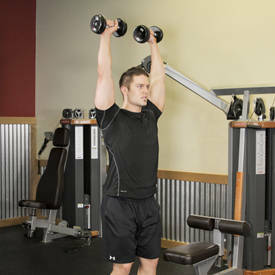 At the bottom, the dumbbells meet in front of his body with a supinated (palms-up) grip. By the time they reach the top of his head, they have rotated to a pronated (palms-down) position. Be sure to watch the video to see exactly how he does it. Capurso dumps the straight-sets approach and goes Tabata-style, deepening the muscle burn and pump. Use a weight you can do for about 20 reps, then alternate Tabata-style 20-second work segments with 10 seconds of rest for 4 minutes. Capurso calls this last exercise the "willpower gut-check." All you're going to do is pull! Grab a modest dumbbell, and reset your Tabata timer for a barrage of upright rows that'll incinerate the middle delts and upper traps. Once again, use a weight you can handle for 20 reps, and go for 4 minutes, broken down into 20-second work segments and 10-second rest intervals. If you need to drop the weight around the fifth or sixth set, do it. At least in the short term, an insane shoulder workout like this is going to cause you some post-workout pain (delayed-onset muscle soreness or DOMS). Adjust your post-workout nutrition and recovery to help battle the pain. But also keep detailed notes about this workout, so you can try to improve on your performance next time around! Great Tasting Protein with Minimal Fat and Carbs and Added Digestive Enzymes! Go Now!